The Zyxel VMG3925-B10B is one of the few VDSL/FTTC routers that have passed Openreach SIN498. The Zyxel VMG3925-B10B router supports the latest Wi-Fi 802.11ac standards and provides high-throughput of up to 1300 Mbps* – times the speed of 802.11n technology at the 5 GHz band.In addition, with the new antenna design and layout, the VMG3925-B10B eliminates dead zones and delivers high-quality full-HD video to multiple devices with IEEE 802.11 a/b/g/n/ac Wi-Fi certification throughout the house or small office. The Zyxel VMG3925-B10B adopts beamforming technology, so signals can aim directly at an end device, such as a tablet, rather than broadcasting in a somewhat haphazard manner. In addition to receiving direction reports from the devices, the access point can estimate where the devices are and deliver signals to them accurately for efficient transmission and enlarged coverage. With IEEE 802.11ac, Zyxel’s VMG3925-B10B provides 2.4GHz and 5GHz connectivity at the same time. Unlike the 2.4GHz band, 5GHz networks are more immune to interference caused by Bluetooth headsets and microwave ovens; and it’s not as crowded as 2.4GHz. Taking advantage of the 5GHz band can eliminate lags for video, gaming and other latency-sensitive applications. 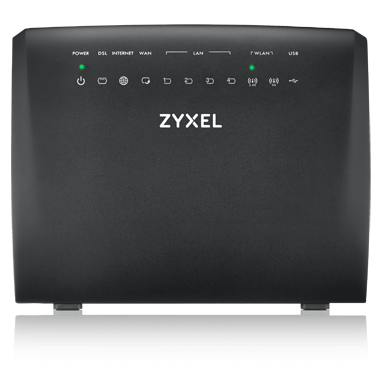 The Zyxel VMG3925-B10B, there is no need to replace the router when migrate from ADSL2+ or VDSL2 to PON or LTE. All you’d need to do is to unplug the DSL line, and then plug the Ethernet cable to the Ethernet WAN port as the existing VMG3925-B10B terminates IP connections via the WAN interface. There is also a USB port for 3G/4G WAN connection. With QoS features, service providers can freely design their QoS policies and prioritize the mission-critical services such as IPTV and VoIP based on their service plan offerings. This increases network efficiency and productivity that enable service providers to offer a real multi-play solution meeting the needs of residential users.